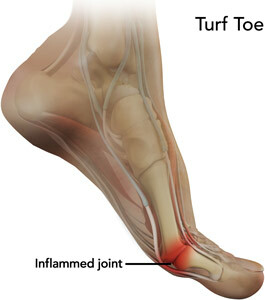 The immediate treatments for turf toe is aimed at reduction of the swelling and inflammation of the affected joint. The RICE therapy (rest, ice, compression, elevation) can be used for the management of pain, swelling and inflammation. In addition to this, anti-inflammatory medications may also be given to relieve the symptoms. The joint may be immobilized by strapping to prevent further injury to the joint.